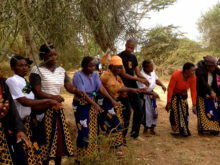 In 2013, Clowns Without Borders USA and Clowns Without Borders South Africa toured South Africa as part of the long partnership between the two chapters. They performed 16 shows for 8000 people. 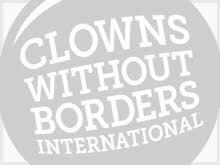 In 2013, Clowns Without Borders Sweden and Clowns Without Borders Australia joined their forces in Myanmar and performed 19 shows for 8000 people. 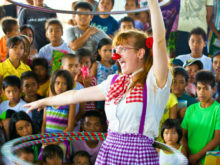 In 2013, Clowns Without Borders USA went to Burma. It was their third year of partnerships with Sweden and France. They offered 7 workshops to 1005 people. 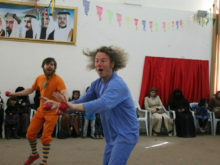 In 2013, Clowns Without Borders Ireland went to Jordan with the support of UNICEF and Save the Children to perform 26 shows for 5000 refugees. In 2013, Clowns Without Borders Ireland brought their support to the child visitors to Cork prison. 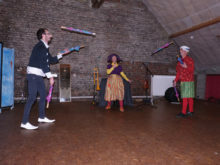 In 2013, Clowns Without Borders Ireland toured through Ireland in various accommodation centers for refugees and asylum seekers. They performed 7 shows for 700 people.